Once more, our team was at Portugal eHealth summit 2019 at Altice Arena, in Lisbon. The event took place from the 19th to the 22nd of March, and it was the stage for hundreds of national and international speakers and exhibitors. On this edition the main topics were Biotech and Life Sciences, Robotics and Domotics, Artificial Intelligence, Eprivacy and Security, Telehealth, Xboarder eHealth, Eprocurement, eBilling, and Digital Health. Our team members were able to gain and share knowledge, and the experience was great to stay updated on the latest development on the field. 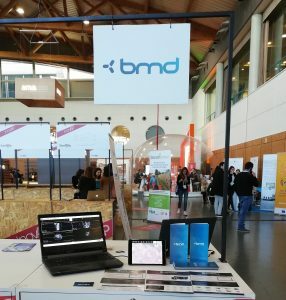 BMD is present in eHealth summit since its beginning, in 2017. To know more about our showcased products, click here. The company is grounded on the 20-years experience of its members, providing innovative solutions for any kind of health institution.